GUARANTEED BEST DEAL ON THE MARKET! 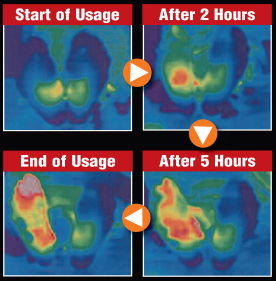 BodyPure® Detox Pads increase circulation to enhance the detoxification process, all while you sleep.. As the blood flow increases, watch the thermographic images change color! "I've used the Body Pure Pads for 6 months, with pre and post hair analysis tests. The tests showed dramatic reductions in Aluminum, Bismuth, Cadmium, Lead, Mercury, and Tin. The pads have also helped rid me of a skin condition in my hands (red and scaling). Needless to say, I am very pleased!" "My dad has circulatory problems. His feet were blue, and it was painful for him to even walk around the house. After using the BodyPure pads, he is now walking all over with no pain, and his feet are a healthy pink color! Also, a customer here at my store has emphyzema/lung and back pain to the extent that he can hardly breathe. After 3 days, he came in all lit up, dancing around the store, telling us his back pain is completely gone, and his breathing is 80% better." "These pads are unbelievable! I've worn them on each foot the last two nights, and the gunk is pouring out. I noticed in the morning that my toenails are clear for the first time in years. They were a yellowish color, and now they look like I went to a spa! I've used various foot bath therapies with no success. Darndest thing I've ever seen." All rights reserved. 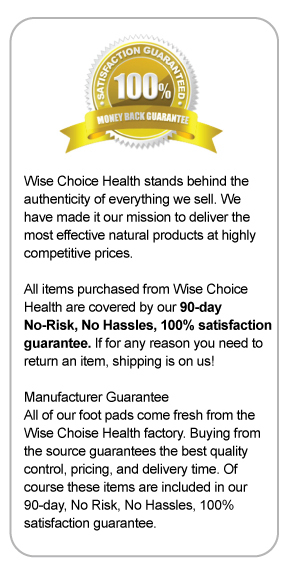 Wise Choice Health, Inc.